← Exclusive: Interview with Douglas Tait! 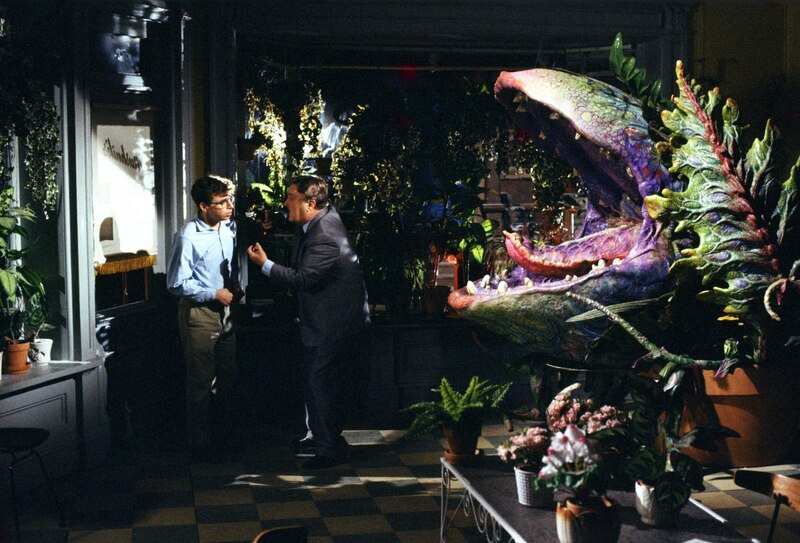 The Little Shop of Horrors began as a low-budgeted film, directed by B-Movie veteran Roger Corman. Based on a $30.000 budget and completed in a very short time, it came to receive — to Corman himself’s surprise — a wide cult following. 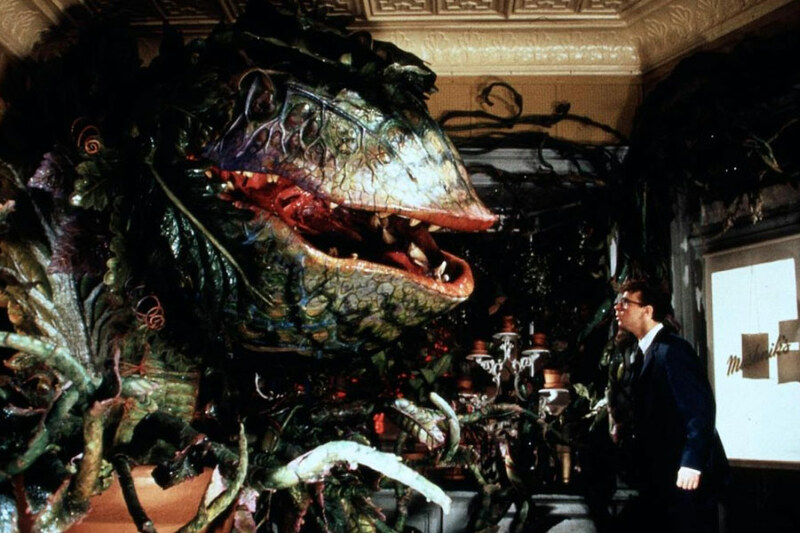 The story of Seymour Krelborn and the voracious man-eating plant resonated within people’s minds, to the point where a Broadway rock-and-roll musical adaptation was created in 1982. 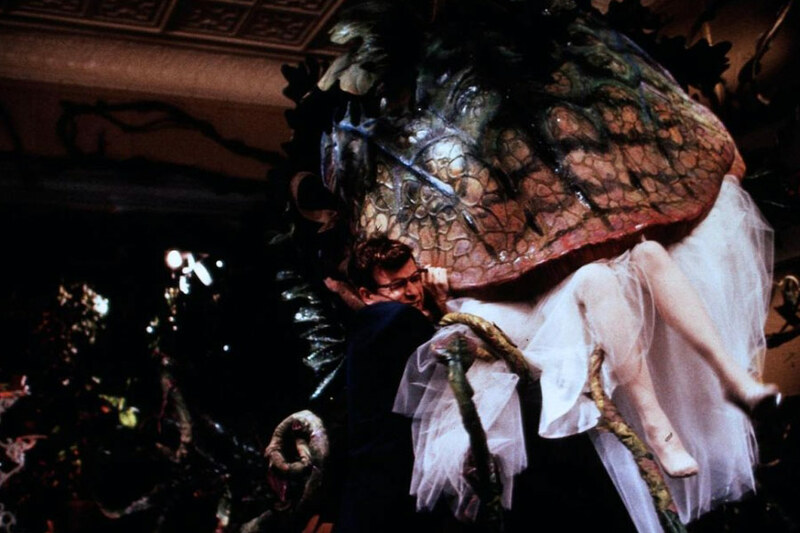 Based on this very musical was Frank Oz’s 1986 film, Little Shop of Horrors; the 26 million dollar budget — close to a thousand times the original film’s — assured a wider liberty to the filmmakers involved. 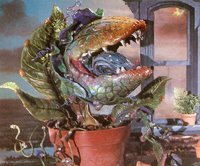 In the original film, Seymour Krelborn crossbreeds a venus flytrap with a botterwort, obtaining a hybrid plant — which he names Audrey Jr., after his secret love interest. 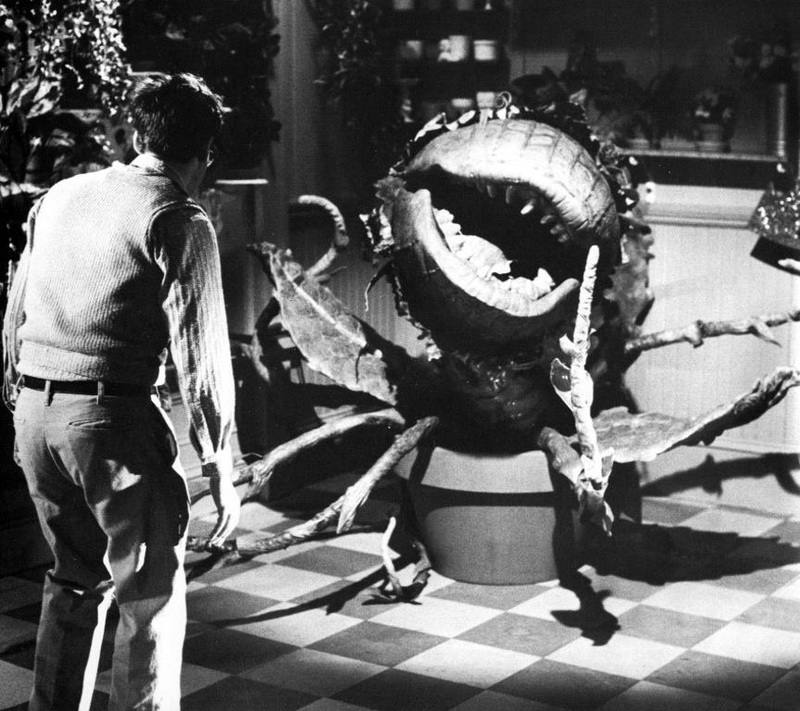 The low budget did not allow advanced creature effects — especially for the time of production — and as such the crew had to resort to simple expedients. 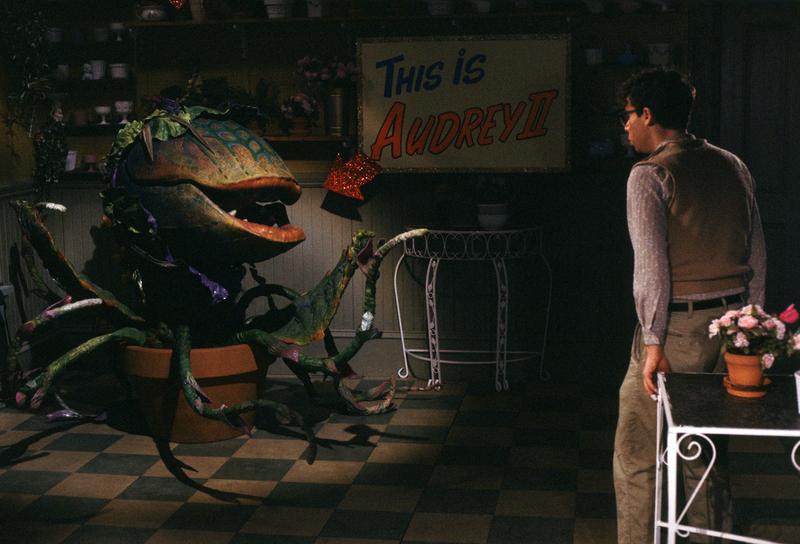 Audrey Jr. was brought to the screen as a series of basic puppets, with rudimentary hand-operated mechanisms animating the mouth — a scissor-type lever hidden within the table the plant was on — and tendrils. 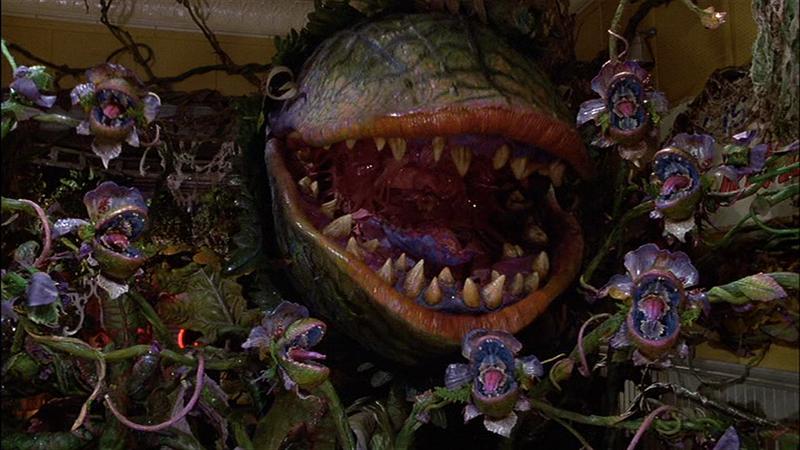 Paintings were also used to portray the victims’ faces growing inside Audrey Jr.’s buds. The character was voiced by Charles B. Griffith, one of the writers of the film. 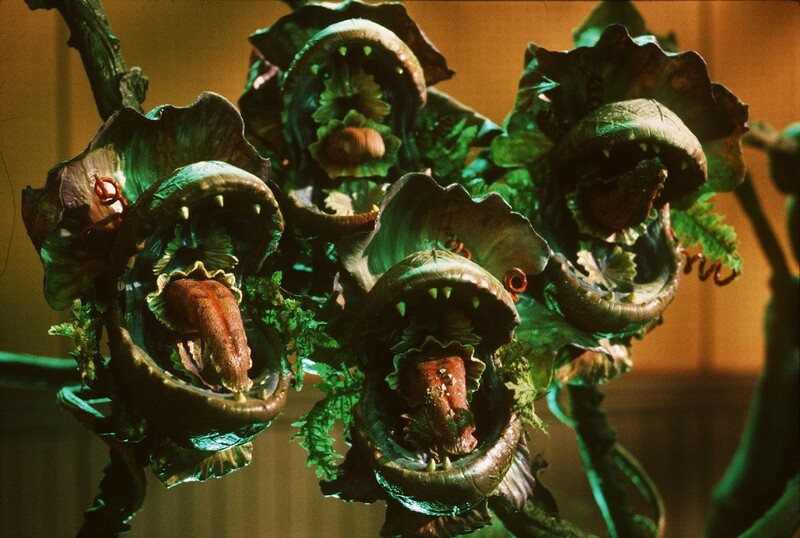 The 1982 musical version expanded upon the original conceit, turning the plant into a devil-like corruptor entity. 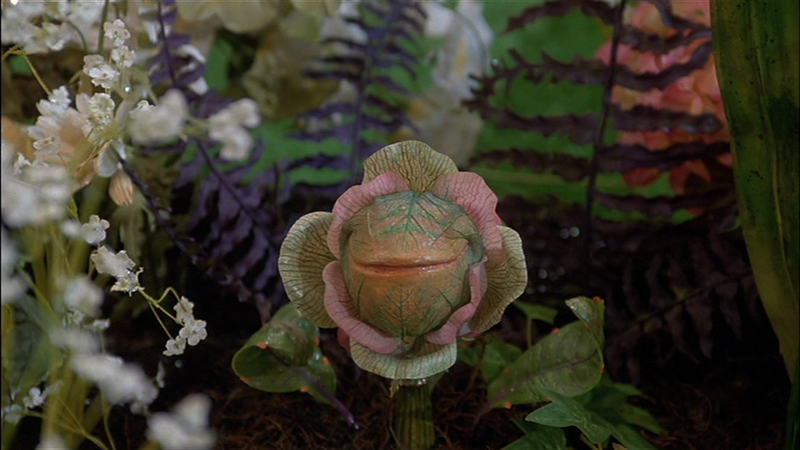 Now baptized Audrey II, the creature is an extraterrestrial, sentient plant sent on Earth through an eclipse, with the intent of conquering the planet. Its voice was provided by the lead vocalist of The Four Tops, Levi Stubbs. “He can sing anything,” said Miles Goodman, composer and musical director for the film, “any way you ask him. We showed him what the plant would look like and a light bulb went off his head. From then on, he was the plant.” Conway added in an interview: “[Stubbs] had to get permission from the Four Tops to do a solo project like this. He was there at Pinewood Studios recording his dialogue while we were shooting. Sometimes we’d have to wait for his recordings to come in, because they were hot off the presses. The playback would be slow and pitch-corrected so it was understandable. He was wonderful — it was perfect casting. Of course, after the first test screening in Los Angeles, all hell broke loose. Frank called me and told me the results of the preview, and that the studio wanted Rodney Dangerfield to re-record the voice! Rodney was hot at the time, and I think they were afraid of audiences being frightened.” Of course, time would prove said executives wrong. 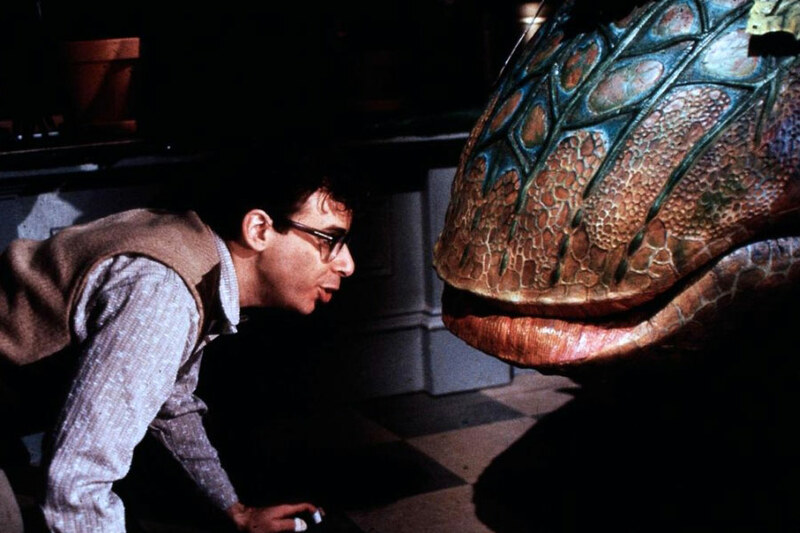 Not only the monster needed to grow from a few inches to over 13 feet — it also needed to talk, and most importantly to sing: this meant that it should be able to perform a convincing lip synchronization. It had to act on stage along with the actors and make a wide array of movements with its jaws and tendrils. 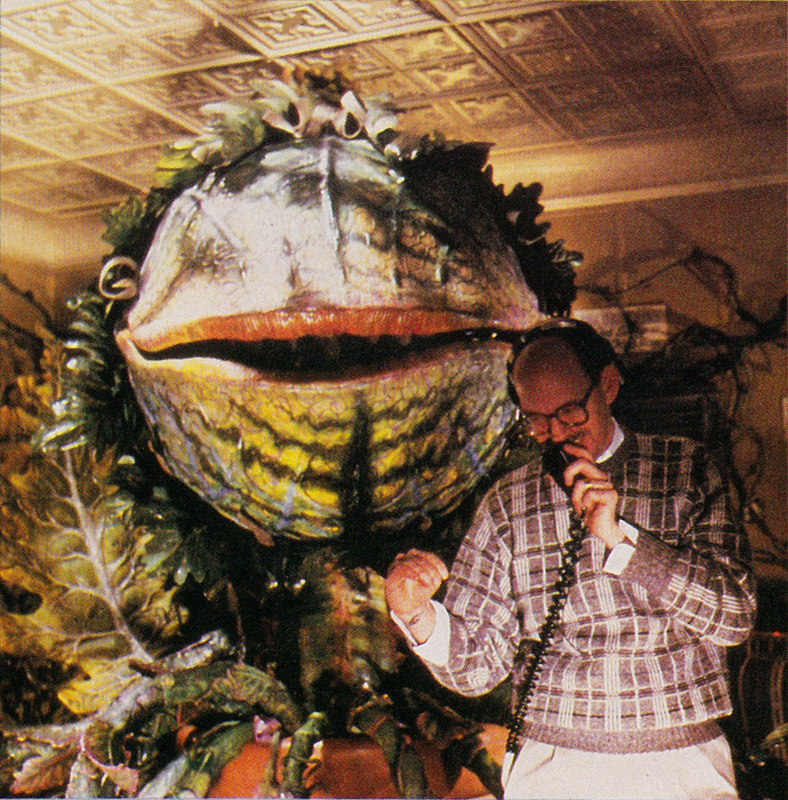 In short, Audrey II requested an unprecedented complexity in animatronic effects. Conway established a basic design to start the building process from. He recalled: “I went to nurseries and places like Kew Gardens in London and took a lot of pictures. I also did a lot of drawings and paintings of orchid textures and cactus stems and succulents. Once I had some ideas, I made up eight-inch maquettes in clay. I’d show them to Frank, we’d talk about them and then I’d go back and make modifications based on his input. That was how I eventually got him to agree with my vision of the plant — he was able to really see what I was talking about. Drawings or paintings are open to interpretation — everyone reads them differently. But the advantage of a maquette is that it can be photographed from many different angles.” Walker also built a miniature set portraying the shop in the same scale as the maquettes, enabling a ‘pre-visualization’ of the plant in the environment. 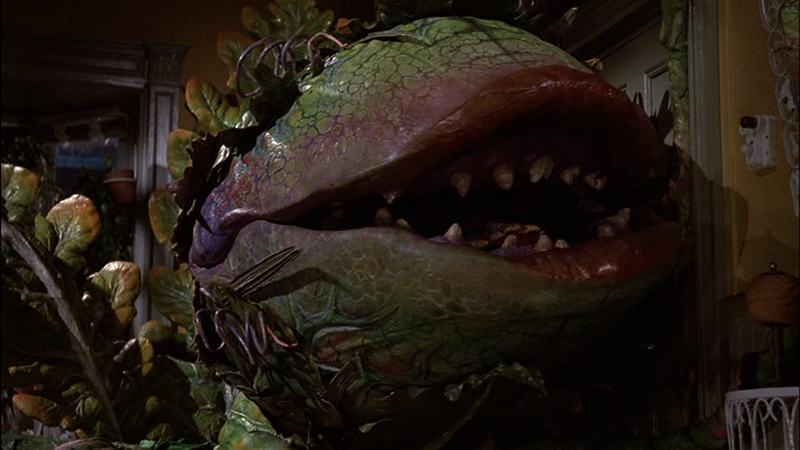 Based on the script, several versions of the plant had to be created, spanning the creature’s constant growth throughout the film. 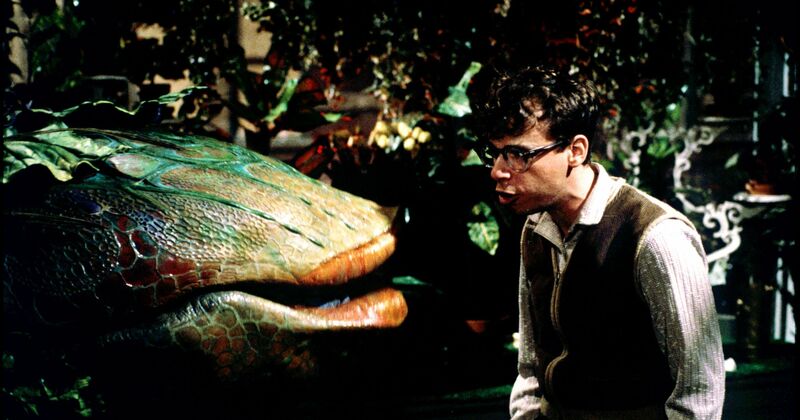 Mechanical effects specialists Neal Scanlan and Chris Ostwald were hired to construct the mechanisms animating the plants. 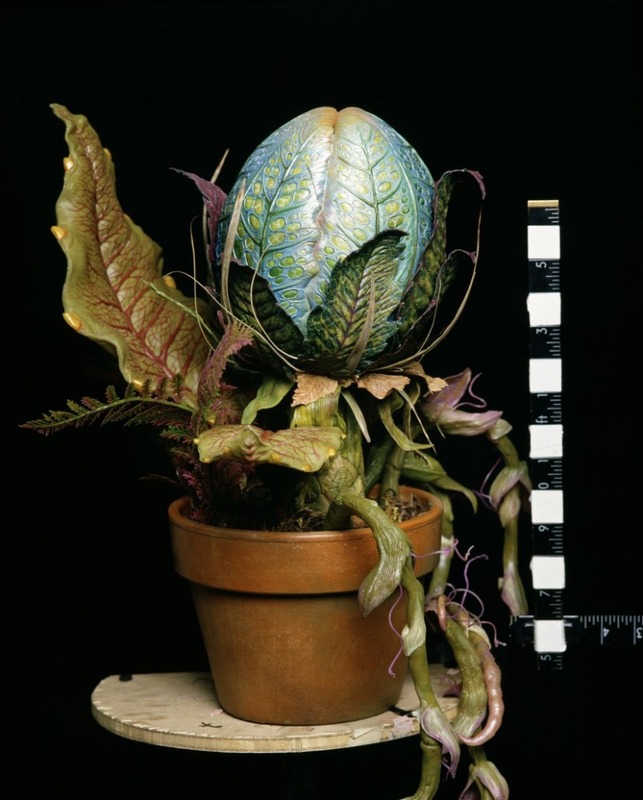 The smaller plants were assigned to Scanlan, with Ostwald working instead on the Mean Green Mother stage. The plants were sculpted by Stuart Smith, John Blakeley and a team of sculptors. 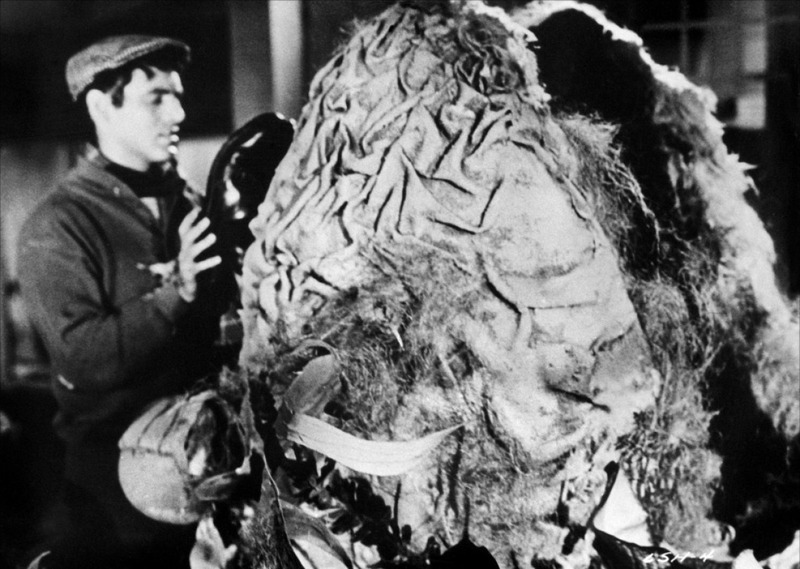 The basic structure of the monster was then moulded in dental acrylic (for the baby stage) or Kevlar (for the ‘radio station’ plant and the following versions), and covered in foam latex skin, which was supervised by Sue Higgins. Textures were progressively added from there. “We added plant textures over the basic shape,” Conway recalled. “I had found a picture of a cross section of a plant cell, and we used that for the surface detail. The skin itself was latex foam laid over the Kevlar skull. It was very thick — a couple of inches — and that kind of foam isn’t really meant to be cast in any volume other than for prosthetic thickness. 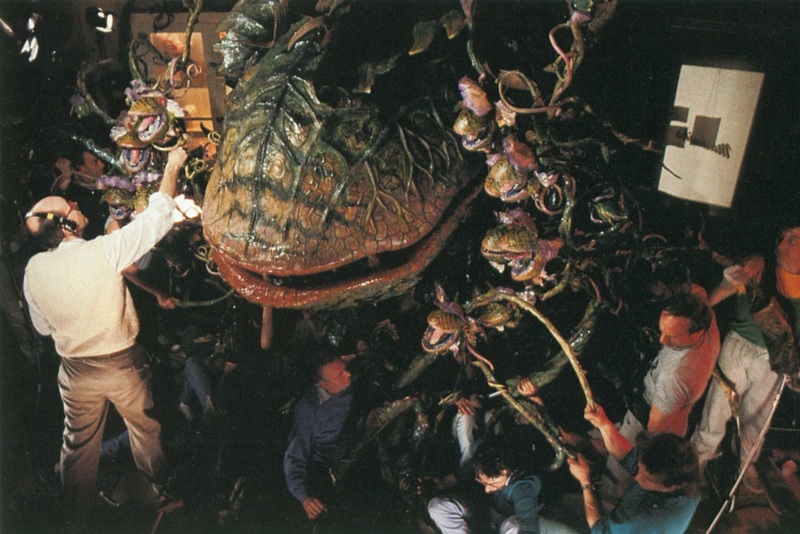 So we had to work with it for a while to get it just right.” Given the failures on the set of Dream Child — which featured a complex animatronic mad hatter — Conway preferred to “keep it simple” and use cable-controlled mechanisms for all versions of Audrey II, as opposed to electronic or hydraulic mechanizations. The performance of the bigger stages of the plant was partly conveyed through its tendrils, which enhanced its bodily language. Construction of various ‘vine units’ was started early in production, and was primarily assigned to Scanlan’s crew. The puppeteering was instead headed by Chris Leith and Don Austen. Conway recalled: “most of the vines were cable-controlled by people underneath the stage. Chris and Don did a terrific job — they got more out of those vines than I ever thought possible. I generally have a sort of love-hate relationship with puppeteers — in this case, I was afraid they would be the ‘aphids’ on my plant. But I have a terrific amount of respect for all these guys and they added a lot to the plant. Most people just look at the lips, but the vine movement is very interesting. 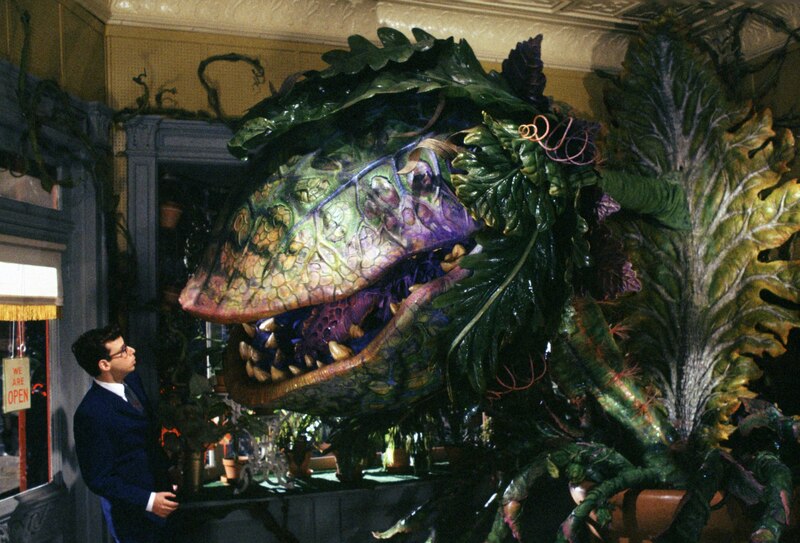 In fact, I think the vines were really the biggest breakthrough in bringing the plant to life. At one point, a vine feels its muscle and another vine makes a fist. Mechanically, they were very controllable. This kind of thing is often done either pneumatically or with marionetting techniques, but these things could stop on a dime.” Marionetting was in fact limited to background vines moving on the walls. “From a mechanical point of view,” Scanlan said, “the main problem with the vines was that we were working with something that was very long and thin and which gave us very little mechanical leverage. Each vine was equipped with lots and lots of disks which gave us a certain amount of leverage and control. Then, through these disks, we ran a series of cables connected to control mechanisms that were like large gimbals — much the same as we had used for the lips. Each cable ran to the end of the vine, so by pulling on the cable — essentially shortening its length — we were able to curl back the tip of the vine. We’d rigged the cables in such a manner that the way they pulled that tip back made ‘s’ shapes with the vine. So even though all we were really doing was pulling the tip to the base, the way the cables were routed produced snakelike shapes and movement. Different cables produced different shapes, and by pulling a combination of cables we could get even more variety of movement depending on how many different cables it had in it.” The tendrils came in various sizes, all with the same mechanism design — but different number of cables (the longest vine featured thirty cables, whilst most only included four). The crew labeled ‘cheap vines’ those with a single cable and a hinge; a trigger mechanism (light enough to be handheld) was implemented to operate the cable. 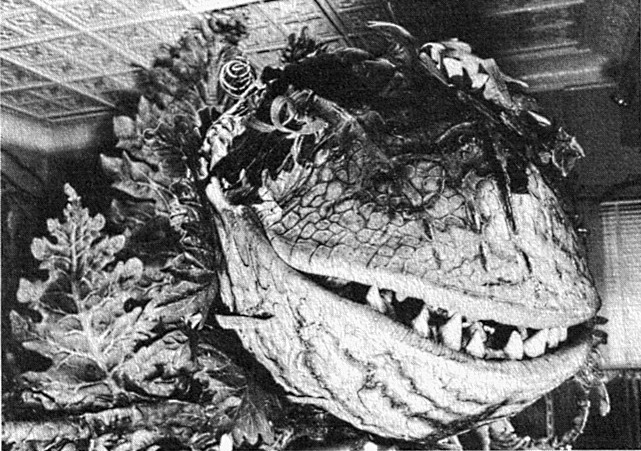 The ‘cheap vines’ were inexpensive and very versatile and were used in scenes where a certain amount of dexterity was needed — such as when Audrey II taps Seymour on the head. 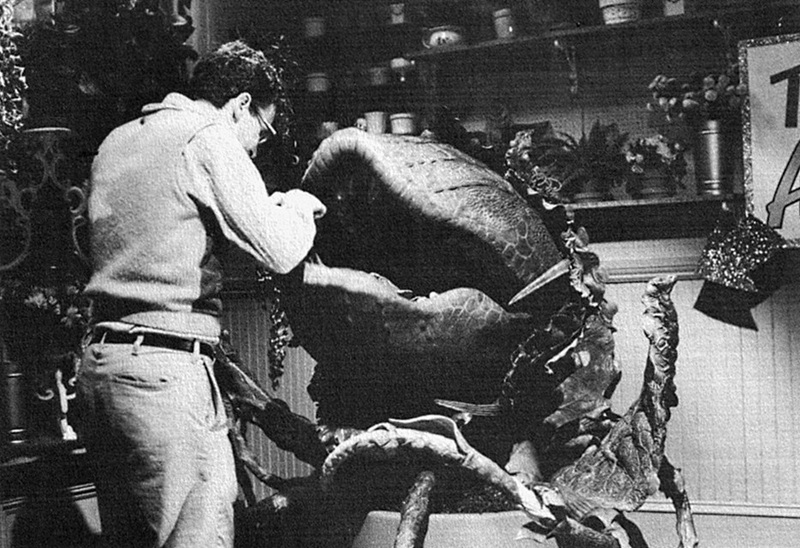 Lyle Conway works on the baby Audrey II. 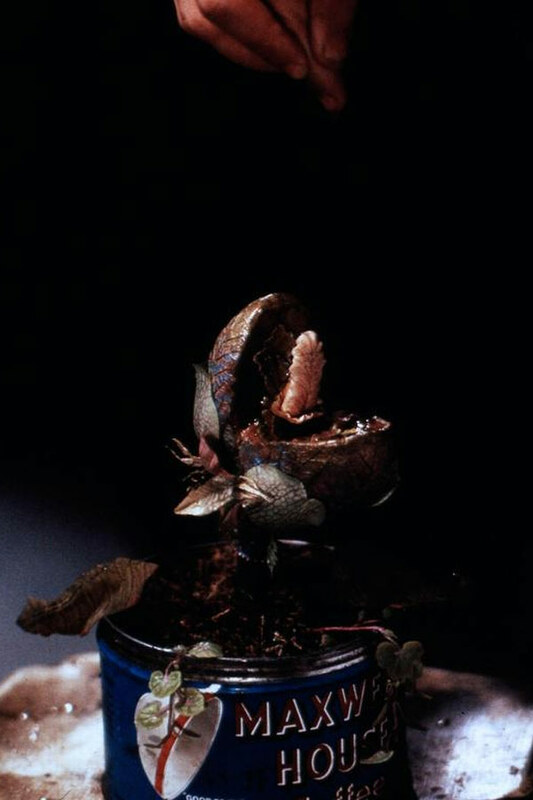 Mak Wilson controlled the head and lips of the plant (both maneuvered with a hand control), as well as the kissing motion and jaw opening mechanisms; Robert Tygner puppeteered the neck. 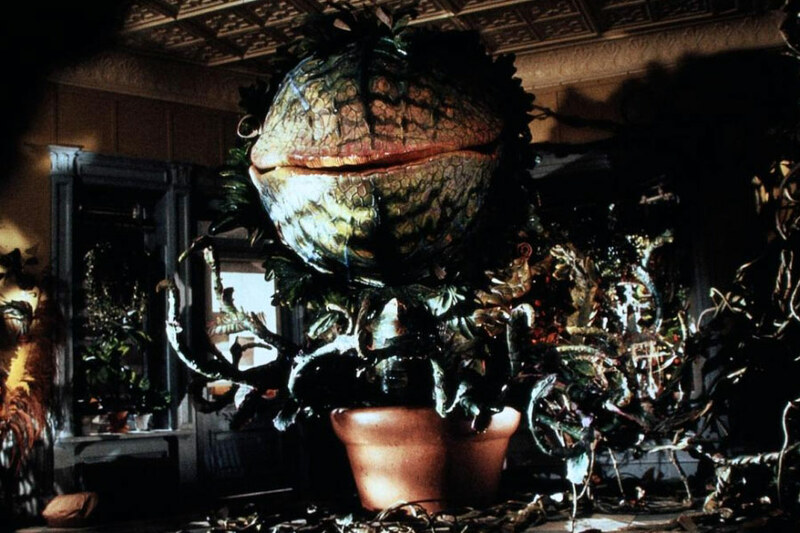 “Basically, it didn’t have that much movement,” Wilson said, “but in the right combinations, it was quite lively and it still took a lot of rehearsals to get to our final result.” The plant was originally supposed to smile when it notices the blood on Seymour’s finger. During the shooting itself, Oz decided against it; this called for a quick “cosmetic surgery.” The head was simply turned upside down. The sucking noises were dubbed towards the end of production by Wilson himself. The simplicity of the plant allowed the crew wider liberty compared to the other versions, also due to the lack of lip-syncing. The head of the plant was operated by hand — but featured over twelve distinct armatures for the main articulations of mouth and lips. Despite their simplicity, the animatronics still needed considerable experimentation. Scanlan explained: “we did all our experimenting on Feed Me. The lip mechanisms were controlled by cables that ran up from underneath the stage, through the stem and into the head while the jaw and head itself were actually operated by the arms and body of a puppeteer. We had that whole thing on a rig which was concealed within the stem. That rig held the cables and took the weight of the plant so that the puppeteer didn’t have to bear all the weight of it. It was very heavy — we had twenty to thirty bales just going up to the head alone, not to mention all the cables which were needed to control the vine movements.” The number of cables was kept to a minimum, in order to obtain a lighter puppet that could be more easily maneuverable by the crewmembers. The main issue met by the crew with the final prototype was not forming the specific shapes with the lips, but rather the speed at which those shapes had to be performed in. Scanlan explained: “you can get the speed when you’re dealing with most puppet movements because you don’t have to be absolutely precise. But the lip-sync had to be fast and precise, and we had to come up with mechanics that would make that possible. We used a much heavier cable than we normally do, for instance. In some cases, we ran a solid wire rather than a normal cable to give us a very direct control.” The controls for the animatronic underneath the stage were built in large dimensions, in order to obtain quick motion of the puppet with small movements of the levers with which the cable controls were coordinated. It is at this point that Conway suggested the use of “undercranking the camera” — a cinematographer term for filming in fast motion (the word itself deriving from the fact it was originally achieved by cranking a hand-cranked camera slower than usual). 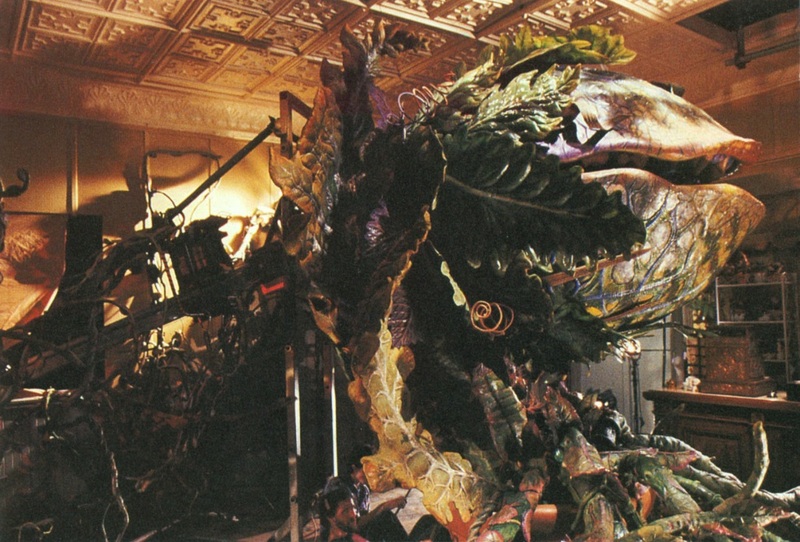 The special effects artist had experimented with the technique whilst working on The Dark Crystal, to give an “extra ‘snap'” to the creatures of the film when the footage was projected at normal speed. 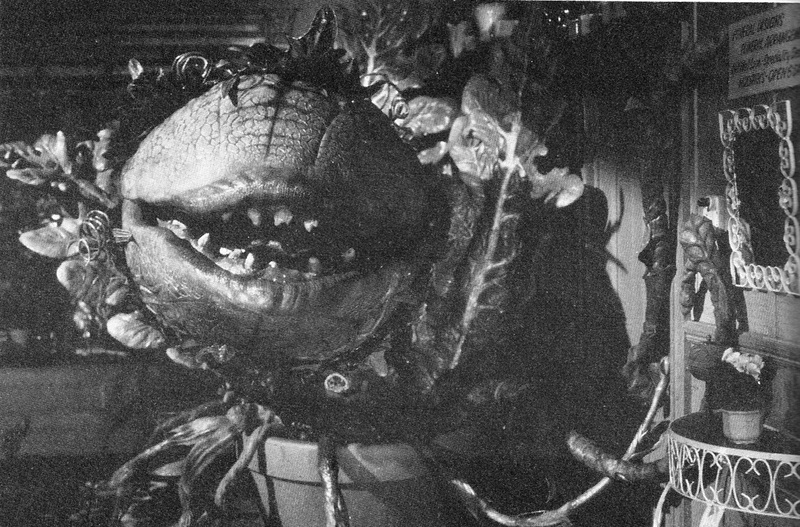 Using fast-motion filming for Audrey II allowed considerably greater precision whilst performing the lip synchronization: it eased both the physical demands for the crew and the mechanical demands for the plant itself. 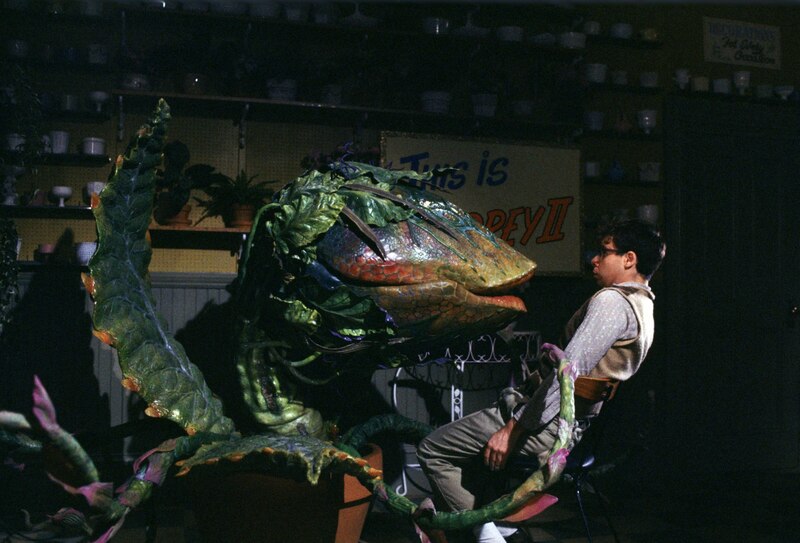 Oz on set with Audrey II. In giving the plant ‘life’, the crew attempted to channel the Broadway performer’s movements. 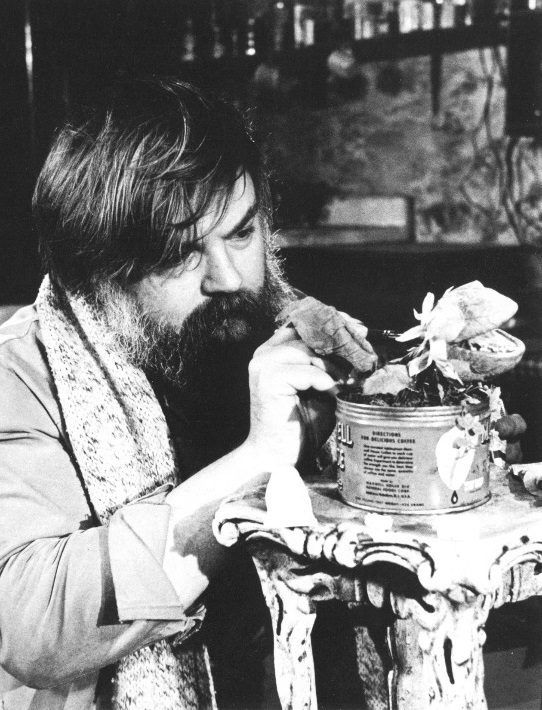 “Marty Robinson performed the plant in the Off-Broadway show,” said Conway, “and he really inspired me. The energy level he had was great; I sat there riveted. So I hoped to capture in our plant the energy that he had in his.” After a total of three months of rehearsals, the Feed Me plant began filming its two-week shoot session. 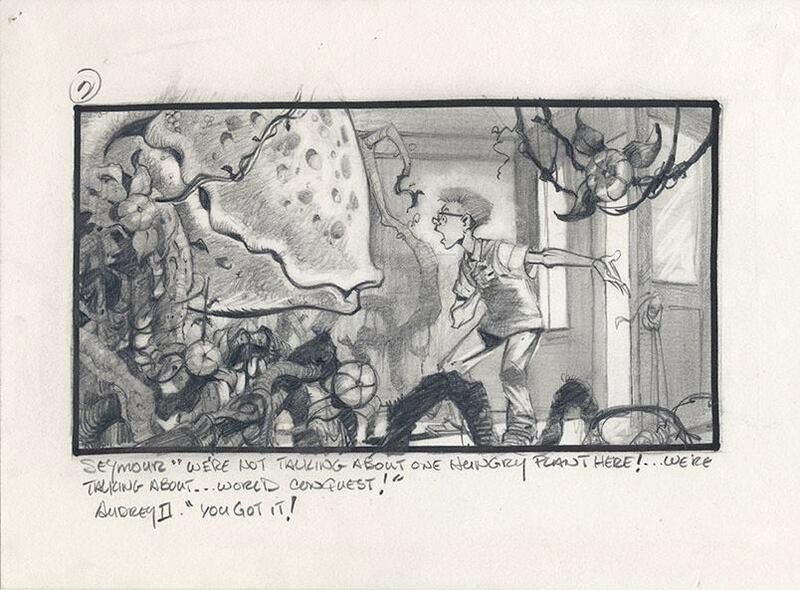 The extensive rehearsals and the detailed storyboards provided by Mike Ploog were fundamental factors in the final result. The set out left “really no room for improvisation,” according to Wilson. “Every once in a while we would throw in a grimace or an expression — and if Frank liked it, we would keep it. Feed Me had a bit more mobility than the others, so we’d occasionally throw in a word out of the side of his mouth. But for the most part, we had precise movements to stick to. We were so concerned with just getting it right, we couldn’t be too concerned with being clever.” No particular issues rose during the shooting — the plant was reliable and did not suffer from considerable breakdowns. 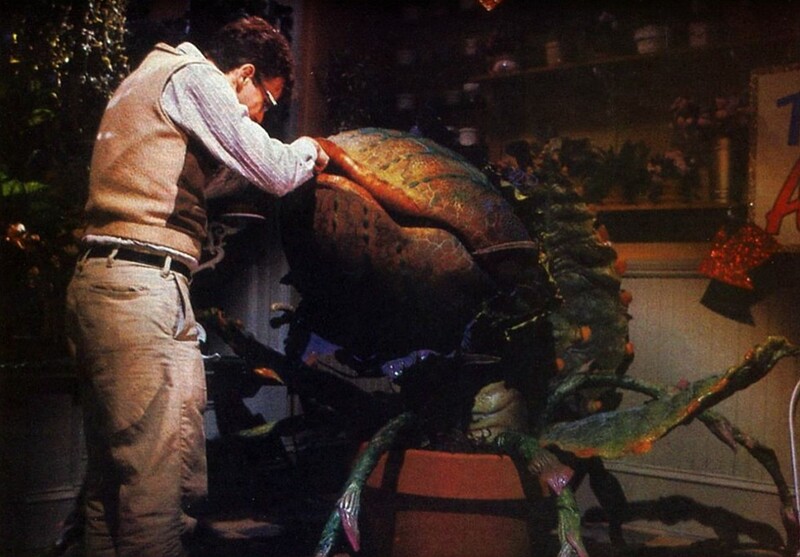 The process was aided by Oz’s own past experience with animatronics, and his knowledge about general limits of the technique, as well as the presence of the maintenance team during rehearsals; the crew could perform quick repairs whenever needed. 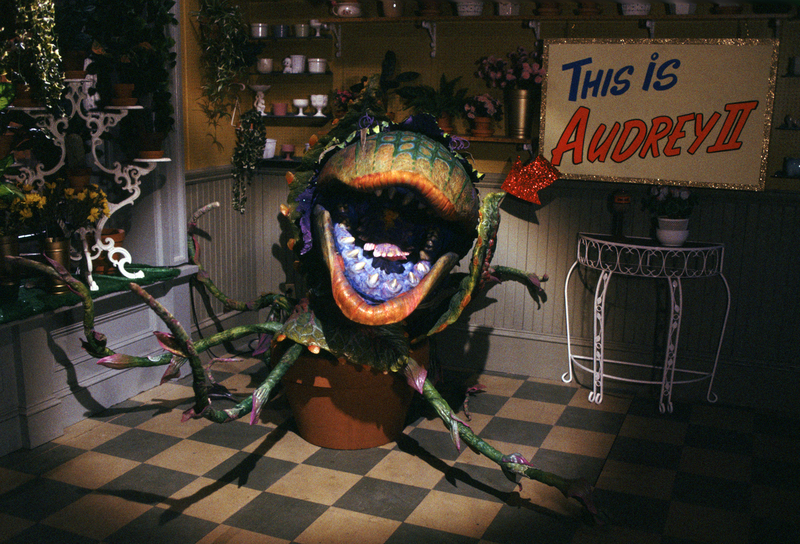 After consuming Orin’s chopped-up corpse, Audrey II again almost grows to twice its size — becoming the 8 feet tall Suppertime (again nicknamed after the song it sings) plant. Neal Scanlan and Tim Wheeler’s crew built the full-size model. Scanlan said: “basically, it was just a big egg with a couple of hinges and we had to shift it for every shot. All of its mechanisms were in the foundation of the pot, with cables coming up through the stem. There was a hinge for its jaw and a hinge for its neck; but because it didn’t do any lip-sync, it had no mechanical lip movement at all. All it could do was tilt back and forth in its base — although it did have a couple of other interesting mechanisms, like a little machine that pumped foam bubbles out the corner of its mouth.” The plant was also equipped with a device to insert Mushnik’s mechanical legs to simulate the scene where the character is devoured alive. The legs were bolted inside the mouth and operated from behind the plant through cables. Conway with the Suppertime plant. The miniature ‘singing’ Suppertime stage. 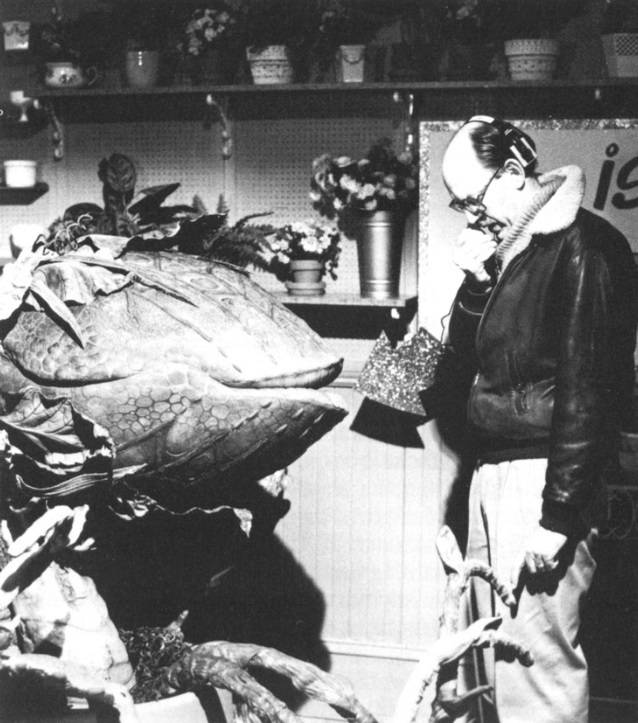 Oz with Audrey II on set. The head of the plant, with a length of seven feet, also required a vertical support — achieved with a 11 feet tall goal post arrangement; it featured holes (distant one foot from one another) in order to easily adjust the height of the actual pivot — which depended on the shot. “The pivot was a straightforward gimbal — a box within a box that was pivoted in two directions so we could get all the degrees of freedom, left and right and up and down. But also incorporated within that were aluminium rollers which enabled the pole itself to ride in and out through the pivot rather than having the whole thing mounted on a huge trolley on wheels. 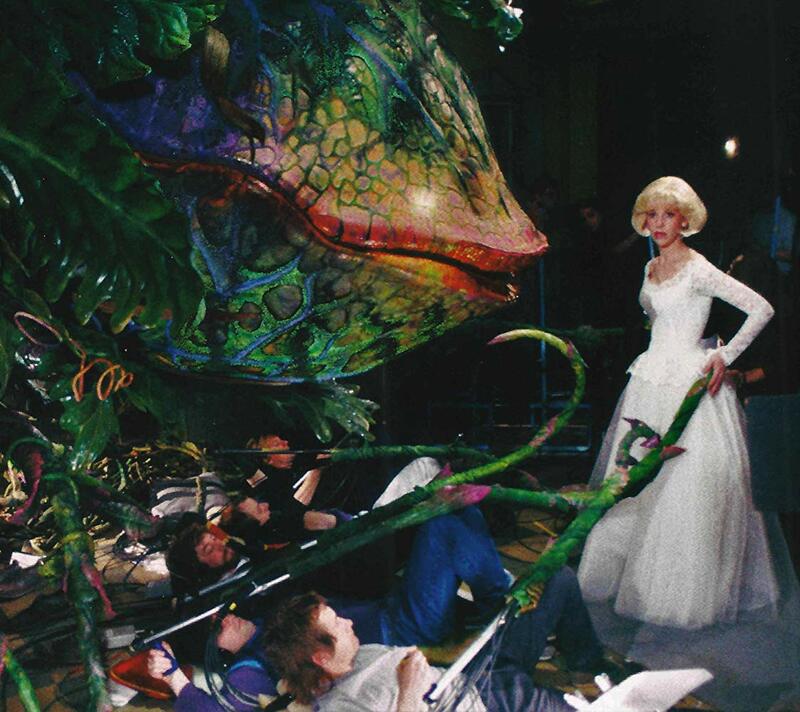 The effect was quite dramatic because the set wasn’t that big and the plant could pretty much reach from one end of it to the other.” A weight carriage was also mounted on rollers, on the other side of the gimbal — in order for it to move in an antiparallel manner to the head. This expedient maintained balance for the animatronic. After the pole arm was completed, the crew began building the basic framework. Since the other plants had priority in the plastering and modeling shops, the artists actually had to improvise. The first prototype was built out of a foam mattress, snipped into shape with “about thirty pairs of scissors”. For the final plant, a tubular framework was built, and then covered with aluminium mesh (“something like an armature for a sculpture,” Ostwald said). Covered again in glass fiber, it was used as the base for the sculpture of the skull — moulded in kevlar sections. The aluminium mesh was removed, and the kevlar model was fixed directly onto the framework. The foam latex used for the skin was moulded in 28 separate sections for the sheer size of the structure it needed to cover. To build a durable (yet lightweight) framework for the lips, Ostwald used a polypropylene underground water pipe about an inch in diameter — something not commonly used in the film industry. “It turned out to be ideal for our purposes,” he said. “We bent it into shape around the inside of the mouth and then connected it to levers and special frictionless cables that gave their lips their movement.” The cables that controlled the lips were usually produced for ship controls, and take “about three months to manufacture.” Their flat shape, combined with the small metal spheres enclosed in flexible cases on either side of them, enabled them not only to be pulled but also to be pushed. The first cables that were manufactured for the project were not large enough and actually had to be replaced. KY Jelly was also implemented to decrease the friction on the lips. 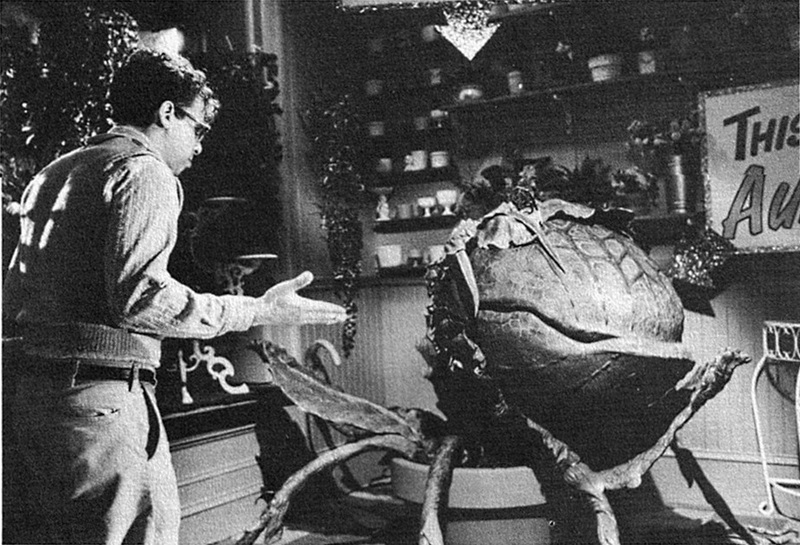 It was commonly assured among the crew that the final Audrey II would not perform lip synchronization as precisely as its former incarnations, with Conway comparing the process to “two mattresses slapped together.” Wilson recalled: “just the sheer size of Mean Green Mother made it incredibly difficult to control. The weight of the lips alone made it a killer. The controls were circular steel tubes over five feet tall — I had to stand on boxes to operate mine. The mechanisms were basically the same as on Feed Me except that the cables were much thicker, making them very hard to work and really hard to push. I’m not particularly strong, so to get my two main controls together I had to criss-cross bungee around my controls to give me extra leverage. Between the weight of that lower lip and the force of the guy inside the pod working the jaw, I had a tremendous amount of gravity working against me. We were all fighting that inertia all the time. A couple of us wound up with pulled muscles from doing it — I was actually out for three weeks because of that.” A ‘back-up’ team of puppeteers — Michael Quinn and David Barclay — was in fact hired to replace Wilson and Tygner whenever needed; in addition, a physical therapist was also among the crew. 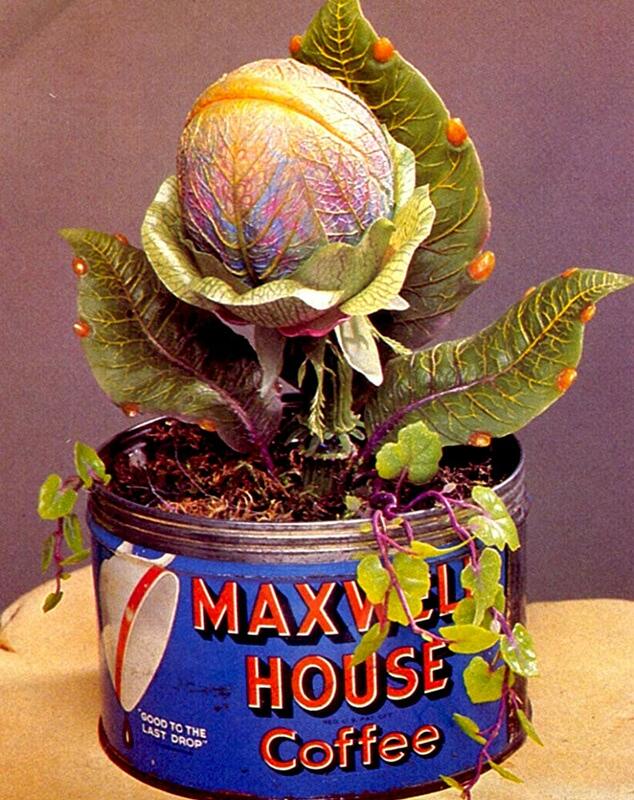 Antony Asbury puppeteered the plant from the inside, being located inside its pod. The artist had precedent experiences with “one-man” puppeteering and mainly the character itself, having operated stage appearances of the plant in cities such as New York and London; obviously, the film needed a far more complex and cooperative effort. He controlled the lower jaw, and by pushing his back up he could also maneuver the upper section. “Inside the plant, he was leaning forward,” Wilson said. “Almost like a jockey sitting on a horse — with his chest supported and his legs going out backwards. As he leaned forward, he looked back between his legs and upside down in a monitor. In his right hand he held the lower jaw and in his other the pole arm going out the back of the plant. That’s how he rode around on that thing. 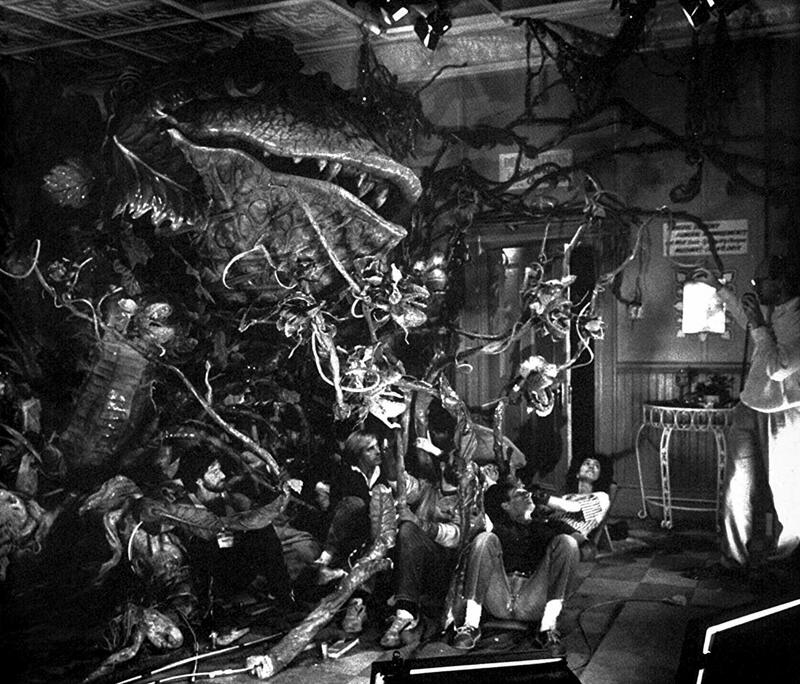 Other people felt rather sick when they had a go on it because there was just no sense of where you were.” Mechanical legs were again employed for the scene where Audrey II attempts to devour the original Audrey alive. In the end, Seymour and Audrey marry and go on to live in Audrey’s dream house. 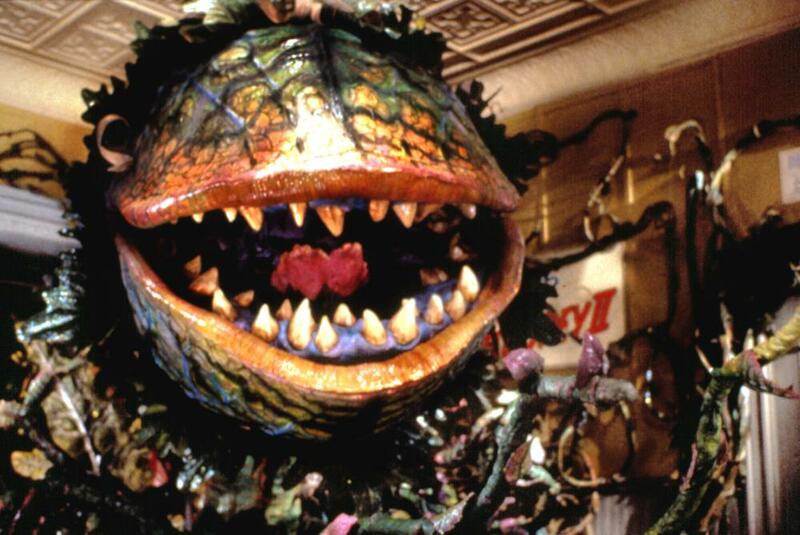 Audrey II also lives on, however — in the form of another newborn bud. 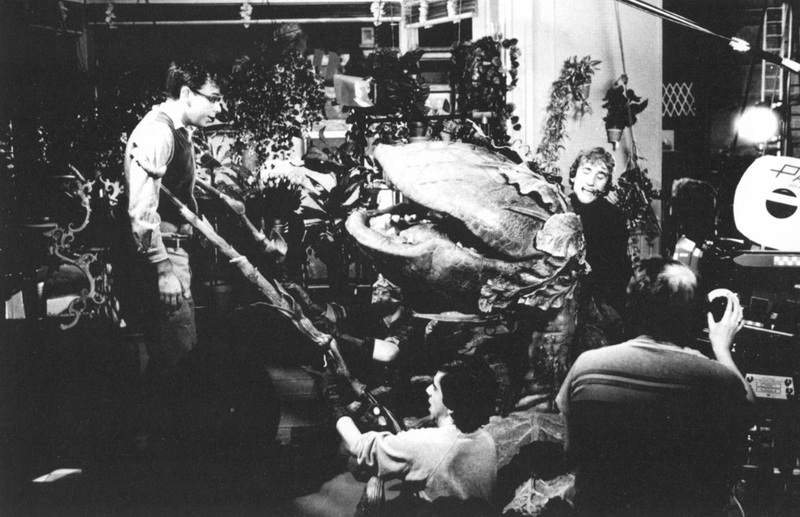 For this shot, the very last of the film, Conway’s crew used a full-size animatronic, about as large as the baby stage — the sculpture of which was in fact reused. The animatronic was simpler — and needed only to turn towards the camera and smile. 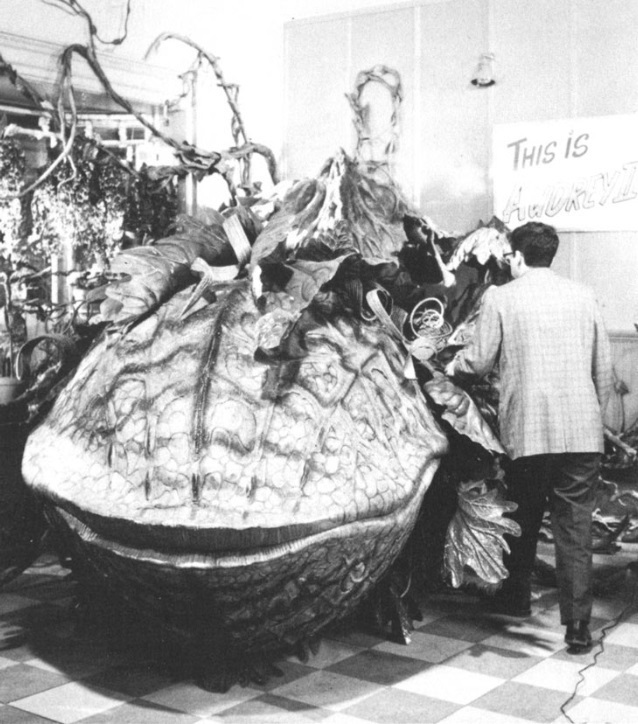 It had actually been built for the original ending of the film — where a new baby Audrey II is shown to Seymour by Patrick Martin. The model was recycled for the theatrical ending, with some of the petals repainted in order to resemble newborn clothing. 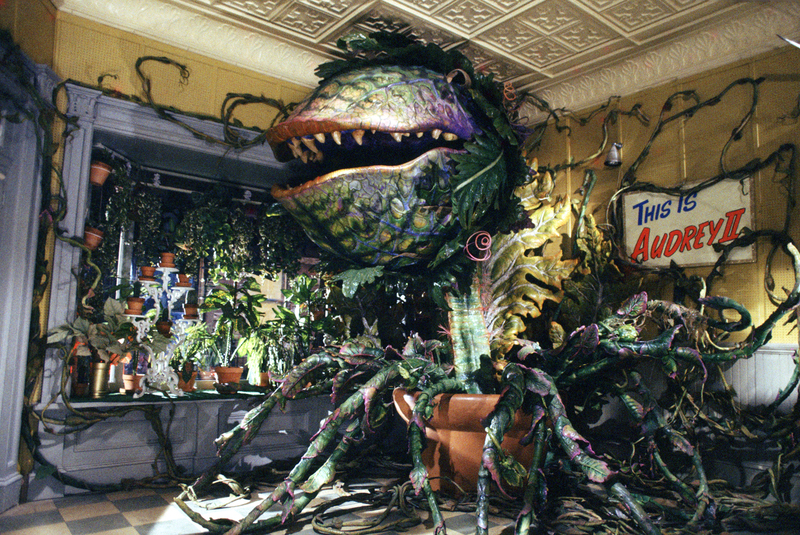 For more pictures of Audrey II, visit the Monster Gallery. 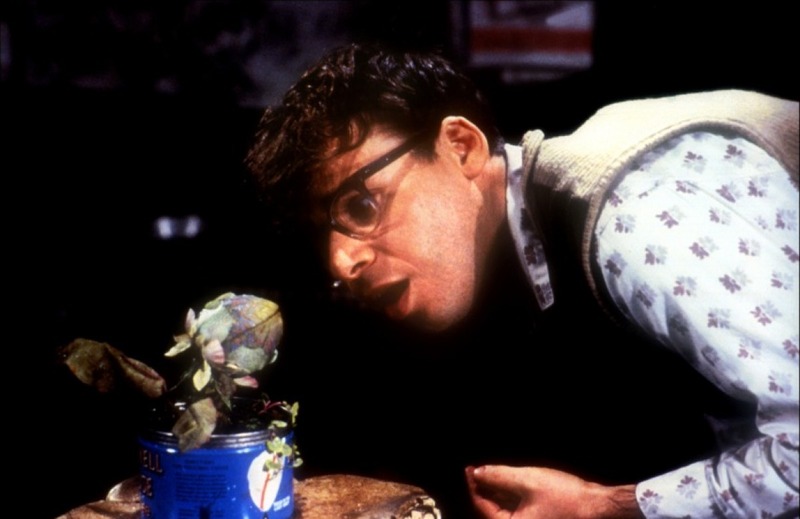 To see what happened in the original ending of Little Shop of Horrors, visit the special: The Plant Conquered the World. 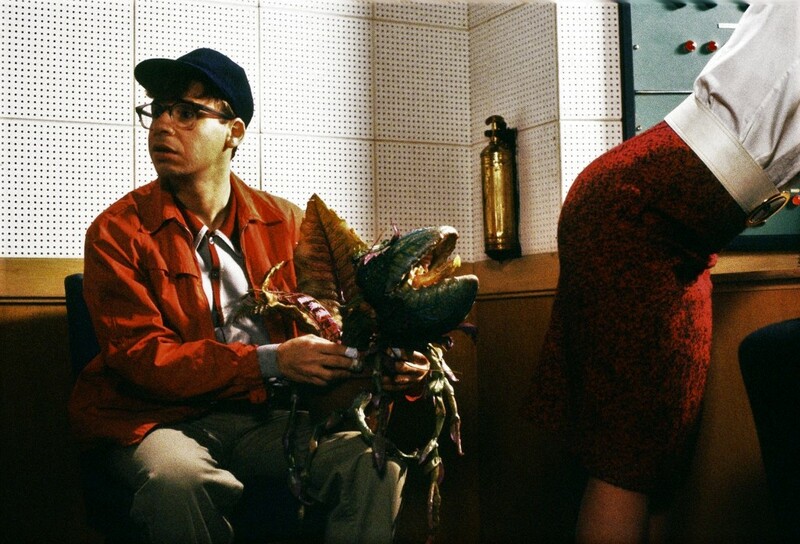 Posted on 13/04/2014, in Movie Monsters and tagged Audrey II, Little Shop of Horrors, Lyle Conway, Roger Corman. Bookmark the permalink. 4 Comments. Wow this is one of the most amazing articles I’ve ever read! The pictures are incredible as well, I’d never seen most of them! Thanks so much for posting! Fascinating read. The under-cranking of the camera took my by surprise as that type of acting is very difficult for an actor. Never noticed that when first seeing the film, but that’s the idea of a good effect. It does explain the quick and forceful movements in the puppet, and really sold the creature very well.